D made a totally yummy breakfast slaw today, pictured above. She’s been on a raw kick lately, reading books and blogs on the subject. We’re going to try incorporating more raw foods into our diet. 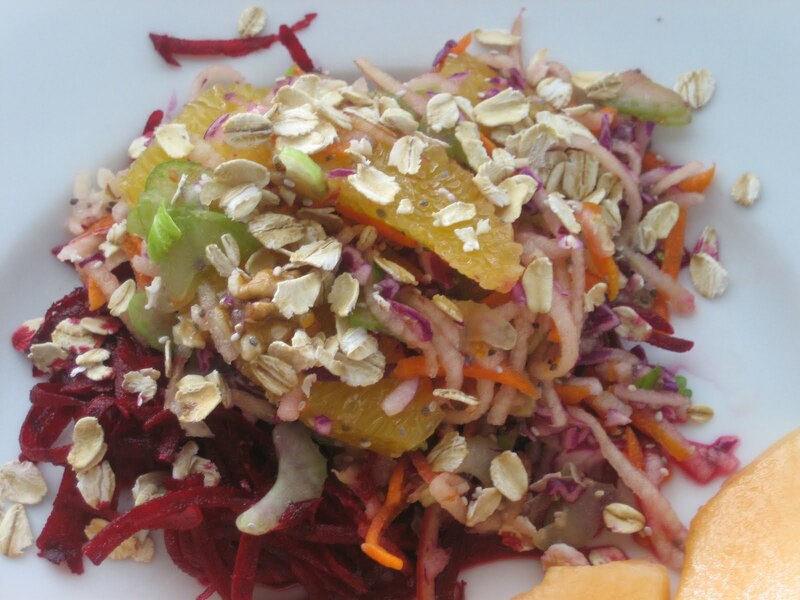 Mix carrot, beets, apple, celery, orange segments, walnuts, chia seeds and red cabbage. Add lemon juice and agave and mix well. Sprinkle rolled oats atop when serving to maintain texture. Note: for the picture, she did not mix the beets with the other ingredients and plated them first, with the rest of the mixture on top, so that the beet color wouldn’t take over the presentation. ETA: Variations we’ve had since this post included the addition of shredded Brussels sprouts, sliced bananas, and dried hibiscus flowers. Add in whatever you wish!